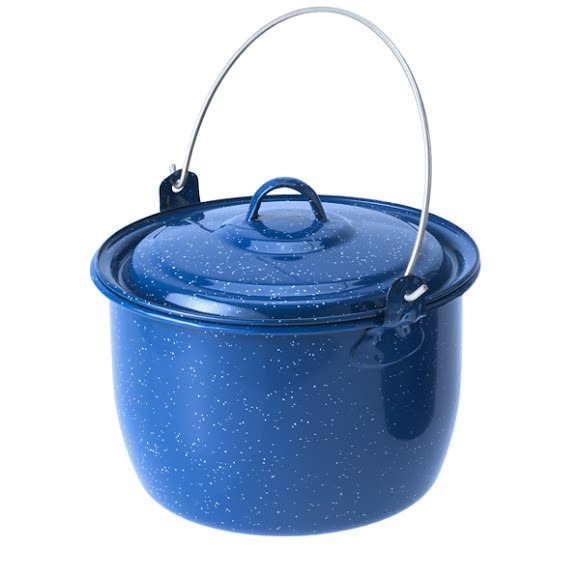 3 quarts of cooking space in an ultra durable Enamelware kettle including lid and handle. GSI Outdoors' cookware performs for life! 3 quarts of cooking space in an ultra durable Enamelware kettle including lid and handle. GSI Outdoors&apos; cookware performs for life! Inspired by traditional Graniteware, GSI&apos;s Enamelware blends old-fashioned charm and functionality into one sturdy package. Built from heavy-gauge steel with a classic speckled enamel finish, every piece has been kiln-hardened twice at 1400deg F to stand up to scratches and chipping. Plus, three-ply construction maximizes heat distribution for even cooking. Dimensions (packed) 10.00" x 8.20" x 5.50"